Few animals instill quite the same fear as sharks. As apex predators many types of sharks are well equipped to inflict serious injury; large, fast, powerful and armed with row upon row of razor sharp teeth these fish are finely honed killing machines. Yet with around 400 shark species it is only a tiny minority that present any danger to humans. I would regard only three, possibly four, of all the species as “man-eating sharks“. 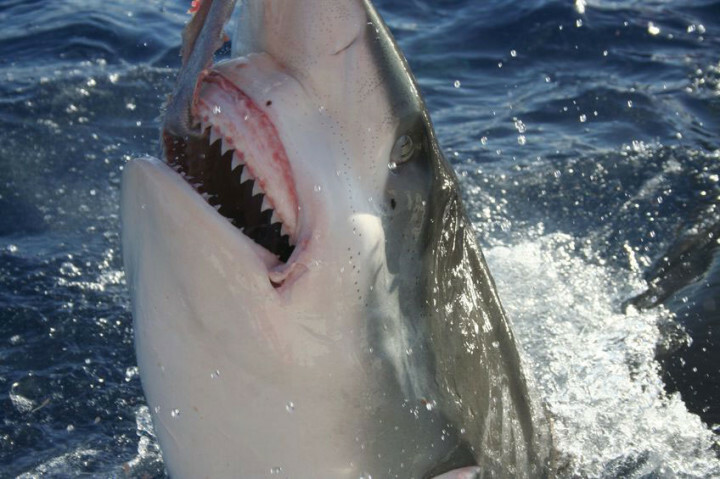 After sifting through the shark attack records held by the International Shark Attack File (ISAF) and the Global Shark Attack File (GSAF) it is clear that only a few species habitually attack people and that many of the other shark species need provoking before they will bite. Statistically it is incredibly rare for any species of shark to attack, but when they do the results can be so horrific that it is burnt into the popular psyche. Reports of victims bitten in two or half eaten by sharks the size of a school bus are always going to be at the back of many people’s minds as they dip their toe in the ocean. Onto the list. Unlike many lists that just rank the sharks purely on the statistics, I have looked at the potential to do damage, aggression and habitats of the sharks to decide which pose the biggest threat to humans. Fatalities: 1The hammerhead sharks are actually a family of sharks (Sphyrnidae) which range in size from less than a metre (3ft) to over 6 metres (20ft). It is believed the strangely shaped head allows the shark better all round vision. To most observers the different species are difficult to tell apart, especially when they’re biting your foot off. It does seem likely though that it is the great hammerhead shark (Sphyrna mokarran) which are the most likely candidates. Reaching a whopping 6+ metres (20ft), weighing up to 600kg (1,300 lb) and equipped with teeth similar to those of the bull shark there is no doubt the great hammerhead could easily inflict deadly injuries on a human. 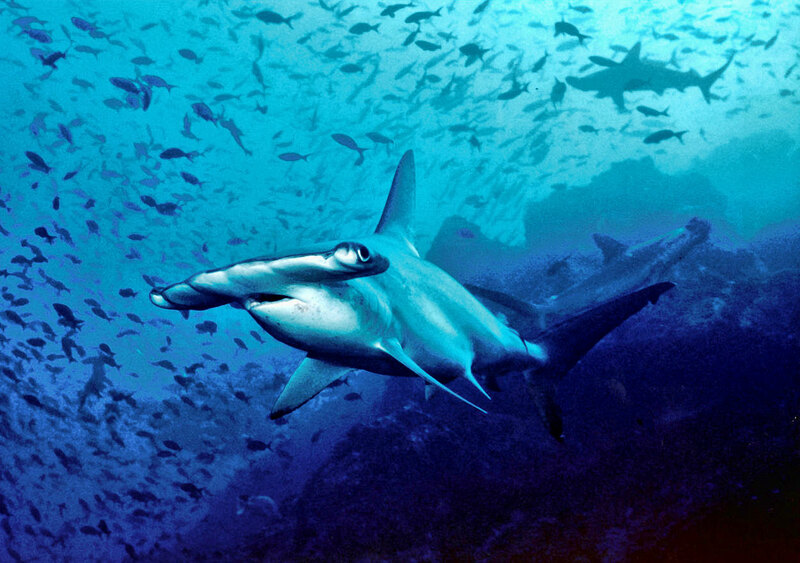 It is also suggested that these may be more aggressive than other hammerhead species. As a group the hammerheads have been involved in 34 attacks over the years, one of which was fatal. Whether this number reflects their potential danger is uncertain as they are an endangered species. Fatalities: 1The blacktip shark (Carcharhinus limbatus) is both common and widely distributed throughout the tropical /subtropical shallows of the world. It gets its name from the black tips and fringes to its fins and tail. Generally blacktips are fairly small measuring less than 5ft (1.6m), however bigger specimens can reach up to 9ft (2.8m) and weigh over 100kg (220lb). What they lack in size they make up for in energy, often being seen leaping out of the water when chasing fish. Blacktip sharks are not generally regarded as being very dangerous to humans owing to their size. But they are frequent attackers, making up the highest percentage of shark attacks in Florida. The ISAF has 41 attacks by blacktip sharks on record, one of which was fatal. Fatalities: 2Many people are familiar with the sand tiger (Carcharias taurus) as the large sharks you see when visiting an aquarium. 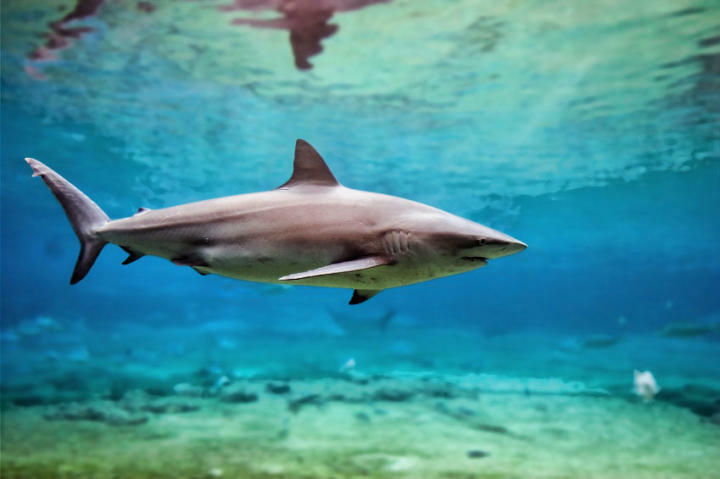 They go by a number of names including grey nurse shark, ragged-tooth shark and blue-nurse sand tiger and are found in warm waters around the world. The sand tiger shark grows to around 3.2 metres (11ft) in length and can weigh up to 160kg (350 lbs). However, it is the ferocious looking teeth that tend to get people’s attention. There are three rows of long, sharp, pointy teeth which menacingly protrude from the sharks mouth. 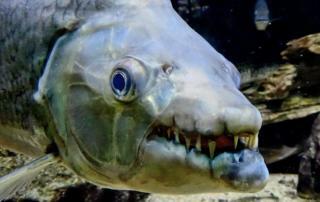 Despite looking terrifying, the teeth are designed for grasping small slippery prey such as fish and squid. Sand tiger sharks probably have a worse reputation than they deserve. The fact they are called ‘tigers’ and frequently roam the surfline putting them into contact with humans does not help their cause. In reality they are not tigers at all and relatively docile. That said they have been known to attack and they have been responsible for two deaths. Many of the attacks seem to have involved spear-fishing where the shark has gone for the catch. There have also been a couple of incidents with people bitten in aquariums. 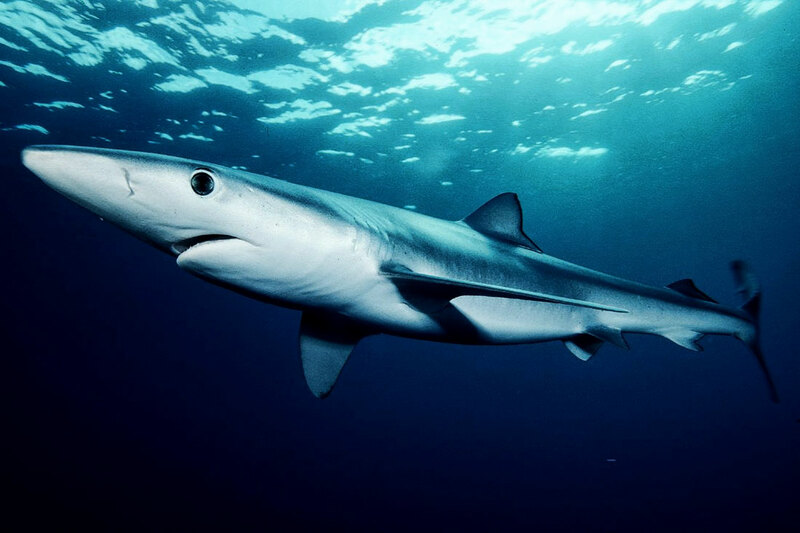 Fatalities: 4Another member of the requiem shark family, the Blue Shark (Prionace glauca) is one of the most widespread and common sharks. It can be found as far north as Norway and as far south as Chile, yet being a deep water species it rarely come into contact with people. This streamlined shark is capable of bursts of speed which it uses for chasing down its prey of squid and fish. The largest specimens recorded are over 12 ft (3.8m), but there have been unconfirmed reports of up to 21 feet. In terms of danger the odds a firmly stacked in humans favour. Between 10 and 20 million sharks are killed a year through fishing. On the other hand the blue shark is considered potentially dangerous and has been responsible for fatal attacks. Some were the result of the shark being landed in a fishing boat but others occurred on shipwrecked sailors in the open ocean. The blue shark is known to circle swimmers and divers for up to 15 minutes and it may be more inclined to take a bit in such situations. Fatalities: 2The bronze whaler or copper shark (Carcharhinus brachyurus) gets its name from its colouring and the fact that this and other sharks would congregate at the sites of whale kills in the days of whaling. It is common in war, but not tropical waters around the world where it spends its time in shallow bays, harbours and estuary mouths. The species is at its most prominent during the annual sardine run in South Africa where it will gorge on the fish in groups exhibiting feeding frenzy behaviour. The bronze whaler is a large shark reaching over 10ft (3m) in length and weighing around 675 lbs (300kg). 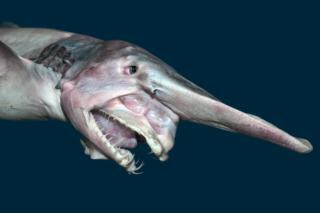 It is a fast powerful swimmer equipped with long serrated teeth. With its size and dentition the whaler does pose a threat to humans and has been implicated in quite a few attacks. 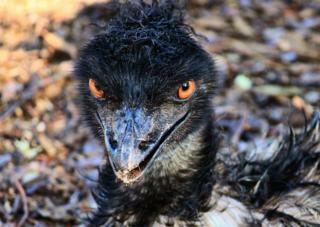 It isn’t generally aggressive towards humans but it has been known to harass spear fishermen. There have also been a number of unprovoked attacks on swimmers and surfers along the east coast of Australia including being implicated in at least two attacks that proved fatal. 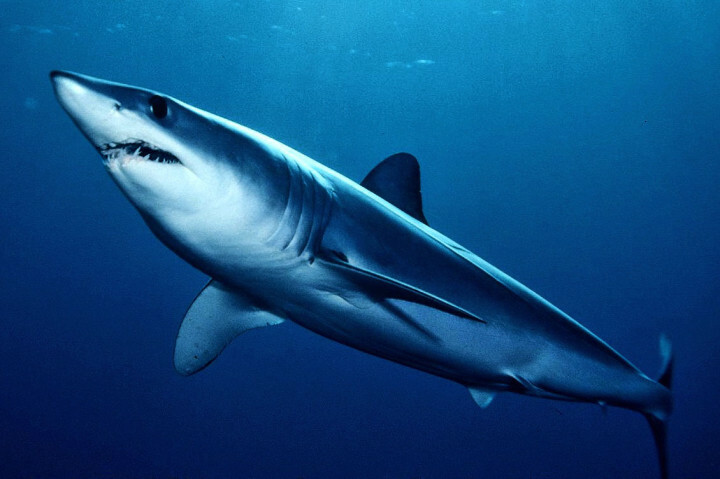 Fatalities: 3The shortfin mako shark (Isurus oxyrinchus), or blue pointer, is a member of the mackerel shark family (Lamnidae). This family contains such illustrious members as the great white shark and prehistoric megalodon. It isn’t a big surprise then to find the mako shark on this list. The warm-blooded mako can grow to a fair size. Adults usually measure around 10ft (3m) but the biggest mako sharks can measure around 15ft (4.5m) and weigh in at nearly a ton. Combined with its size the mako has an incredible turn of speed. This shark has been recorded at up to 46 mph (74km/h) and some scientists suggest it can go much faster. With this speed the mako shark can make incredible leaps out of the water. One problem is that this often lands them in the middle of a fishing boat and they have been known to inflict severe injuries out of the water. Makos have been responsible for three recorded deaths and have a reputation for aggression. 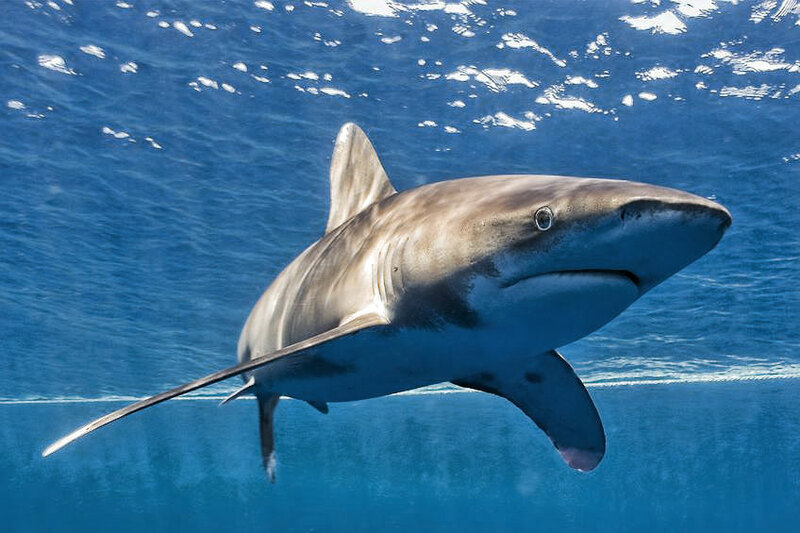 Fatalities: manyThe oceanic whitetip shark (Carcharhinus longimanus) is the first of the sharks on this list I would genuinely classify as a “man-eater”. It has almost definitely killed more people than all the other sharks put together. The reason it is not at the top of the list is the vast majority of these attacks were completely opportunistic and the result of air and sea disasters. There were several incidents of ships being sunk during World War II in which it is believed sharks were responsible for hundreds of deaths, with the prime attacker being the whitetip. As well as a attacking in the open ocean the whitetip has been implicated in a number of fatal attacks on swimmers and divers including a series of notorious attacks in the Red Sea in 2010 which left one woman dead. Fatalities: 29The tiger shark (Galeocerdo cuvier) is big, common and aggressive. The name comes from both its temperament and the stripes running down its sides. It is also known as “the garbage can of the sea” as it commonly swallows anythings it comes across. 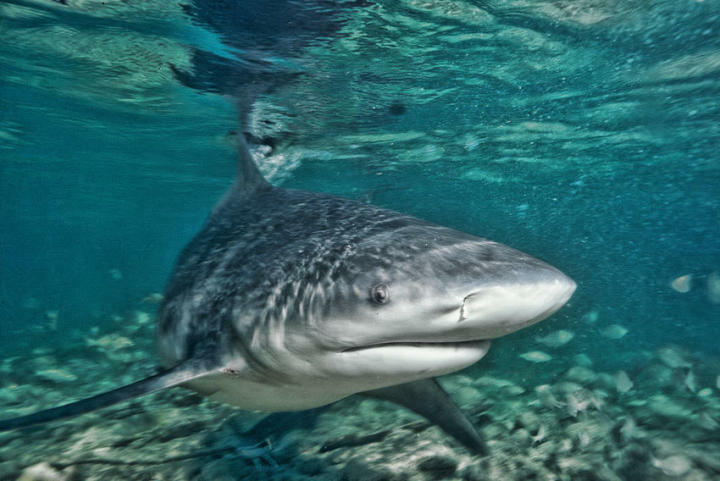 Objects recovered from tiger sharks’ stomachs include bottles, tires, clothes, cats, pigs and even a whole horse head. You get the picture! More common prey include fish, seals, dolphins, birds and turtles. The tiger shark can be found in coastal tropical and sub-tropical waters around the world although they tend to stay in water deeper than 20 feet (6m). Tigers are the fourth biggest of all sharks with large specimens reaching well over 16ft (5m) and weighing over a ton. It really is a bit of a bruiser with its heavy build and incredibly thick skin (8 times thicker than cowhide). They also have a proportionately wider mouth than other sharks. This prodigious mouth is lined with serrated teeth which are perfect for slicing prey, as opposed to gripping like many of the sharks above. Obviously humans are no match for a shark with these attributes and the tiger shark has a well earned reputation as a maneater. It is without doubt the most dangerous shark in the tropics and accounts for the majority of attacks in Australia and Hawaii. The statistics speak for themselves, the number of fatalities is second only to the great white shark and the death rate from attacks is high. Fatalities: 26The bull shark (Carcharhinus leucas) is considered to be the most dangerous shark of all by many. However, it doesn’t seem to have acquired quite the reputation of the great white and tiger sharks. There are several reasons why this shark is considered particularly dangerous including its physical attributes. Bulls also go by more names than most sharks, which is indication of its range and distribution. These include the Ganges shark, Nicaragua shark, river shark, Swan River Whaler, shovelnose, bull whaler, Fitzroy Creek whaler, square-nose, and Van Rooyen’s shark. The bull shark is a large powerful shark, measuring up to 11.5 feet (3.5m) in length and up to 700lbs (318 kg) in weight. It gets its name from its flat snout and stocky build along with its pugnacious nature. It comes well equipped in the jaws department too with several rows of triangular, serrated teeth ideal for slicing through prey. Highly territorial this shark will attack other species that it feels threaten its territory and that includes humans. What makes bull sharks particularly dangerous to humans is the likelihood of crossing paths with one of these brutes is higher than with any other of the dangerous sharks. Not only does the bull shark live in shallow coastal waters it can do something most other sharks cannot – tolerate fresh water. The sharks specially adapted kidneys allow it to travel thousands of miles up rivers and even live in lakes. Not happy with merely being able to swim up the rivers of the world the bull shark has also claimed many victims in freshwater. 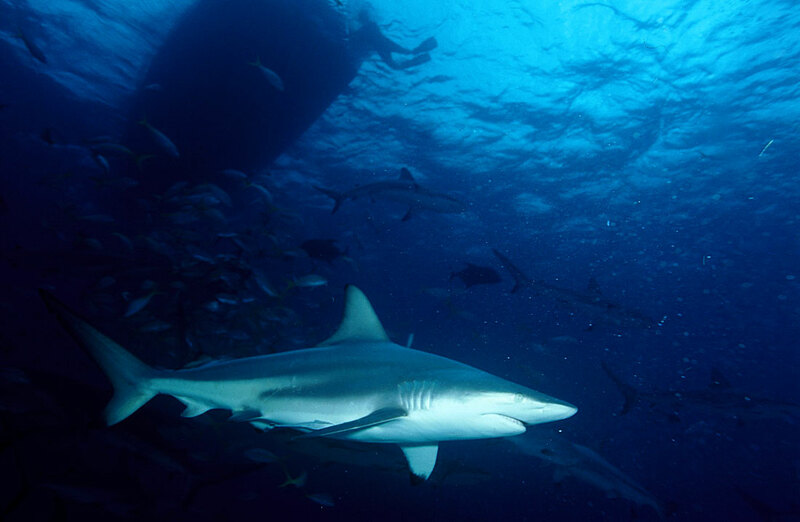 Ranked third by number of attacks in the ISAF records it is believed that many of the bull sharks attacks go unreported as they occur in the third world. There have been 104 recorded attacks of which a third were fatal. 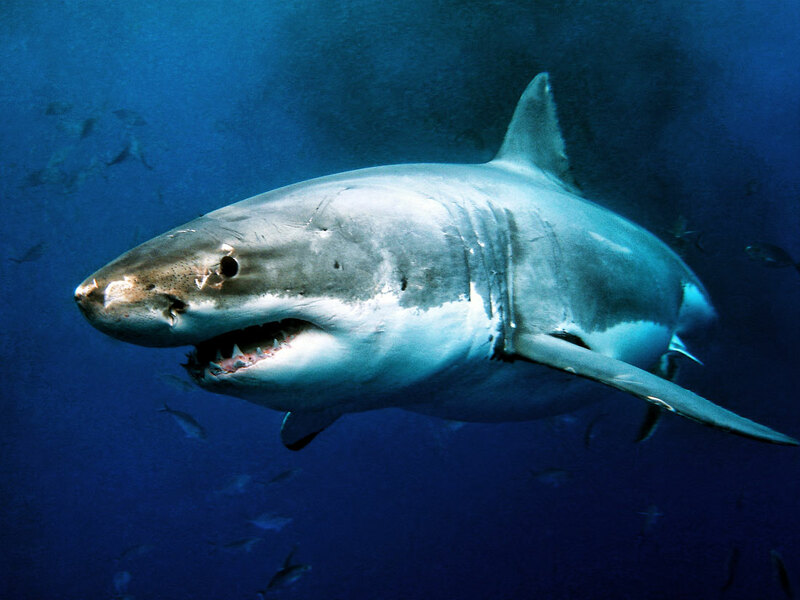 Fatalities: 74Just the name Great White Shark is enough to send people running from the beach. Already notorious the Jaws movies of the 1970s further demonised this shark (if that was necessary?!) and consolidated its reputation as a man eater. Carcharodon carcharias is though, without doubt, one of planet Earth’s ultimate killing machines. The biggest great white specimens are around 6.5 metres (22ft) in length. However, several reports of sharks as big as 8 metres (26ft) and weighing nearly 3.5 tons have been published. Set between crushingly powerful jaws are rows of triangular teeth around 3 inches long which are serrated along either side. These are used to slice up the prey which the shark does by shaking its head from side to side. If a tooth is broken one from the row behind takes its place. This shark is no slouch either. When heading in for the kill the great white can accelerate to 35 mph (56 km/h). Combined with its bulk this is like being hit by a freight train and will stun or even kill the prey. With usual prey animals such as sea lions and seals humans stand practically no chance against this beast. Great whites actually have no interest in eating humans, nowhere near enough flesh, and it seems most attacks are mistaken identity or the shark just being inquisitive. Unfortunately a 3 ton shark giving an inquisitive nibble can involve the loss of an arm or a leg. These sharks occur in all the oceans of the world and tolerate water temperatures between 12 and 24°C (54 and 75 °F). They can be found in deep water or near the coast, generally around seal colonies. Great whites are most concentrated around the shores of South Africa, Australia, Northeast USA, California, Japan and the Mediterranean. That last one surprises a lot of people, especially as there have been over 30 recorded attacks in the Med. Without doubt the great white is the most dangerous of all sharks and the statistics back this up with over 400 attacks recorded worldwide of which many were fatal. Ironically, it is the great white that needs protecting from man and with numbers on the decline it is a protected species in many countries. To end this article I thought I’d share this video that shows another side to the great white shark. Here we see Ocean Ramsey free diving with what is regarded as one of the most dangerous animals on the planet. I swim daily in the Clarence River which is a breeding ground for bull sharks, it’s quite a popular swimming river, the water is warm and fast flowing. I swim where the water is brackish, people pull out 6 foot bull sharks fishing all the time and they are seen to be chasing fishermen catches as they drag them in. There hasn’t been any human attacks in the Clarence River that I can find record of, and one guy pulls out 800 a year. There is more than enough fish, turtles, eels etc in the river that I guess they don’t particularly feel the need to go after the daily human and cattle hanging out in the water. Oceanic white tip should’ve been number one. Just the like the bull shark they have unprovoked attacks and they are very aggressive also very unpredictable one moment may be calm the next it’ll just snap. In great white cases it’s just a lot of mistaken identity. Also the actual number of deaths is not known for the oceanic white tip shark, so a lot is a good estimate. Although they did say that the Oceanic Whitetip was probably the most dangerous shark. The Great White was at the number one position. Ahead of The Tiger and Bullshark, which I thought one of them kill more than the Great White. 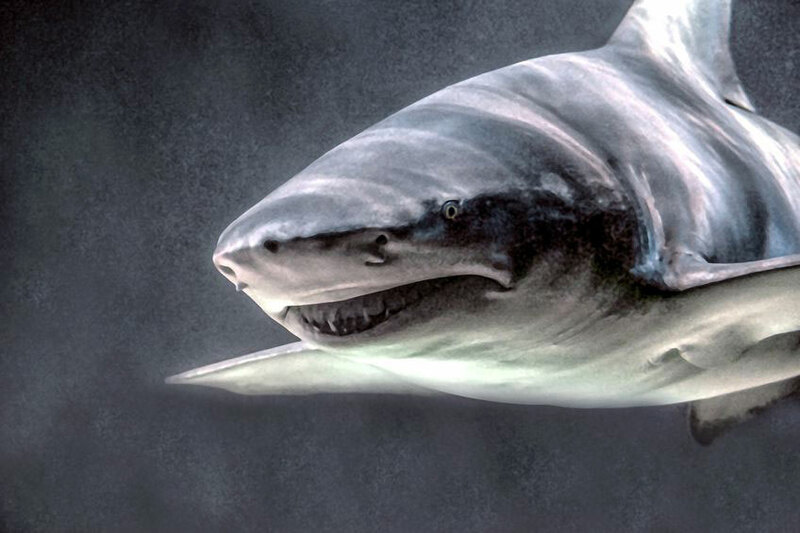 Jacques Cousteqa referred to the Whitetip as “The most dangerous of all sharks”. The killed many people during the war. I do think that the bull shark is one of the most aggressive, and Great Whites do mistake surfers for seals. I guess the article is going by the number of attacks and fatalities. I just watched a video of a women riding on a Great White with nothing for protection. If the tiger shark has more attacks and more fatalities than the bull shark, why is it # 3 instead of # 2? Because the bull can swim in fresh water? ^ pretty much this. Also, I suspect many attacks by bull sharks are wrongly attributed to other species. From the article: “In reality they are not tigers at all and relatively docile. That said they have been known to attack and they have been responsible for two deaths”. You left out the actual most deadly shark EVER!!!!!!! The Megalodon shark!!!!!!! P.S. that shark isn’t extinct and its most deadly so stop your arguing over which shark is most deadly! 1.) Megladons are extinct, I don’t know where you got that from but it’s not true. 2.) They would be confined to deep sea even if they did exist. 3.) If what you’re saying about the existence of Megladon is true, why hasn’t there been any attacks? Your trying to tell me it’s existed for millions of years and there’s never been an attack? And your telling me it’s the most dangerous shark? You’re quite simply wrong. Damn, that girl is incredibly hot. white women are so beautiful. A little weird in the head, but beautiful.